Historically, drug discovery and development has been a relatively isolated endeavour, with little information sharing evident among different pharmaceutical companies and academic researchers. In recent years, however, it has become apparent that pharmaceutical R &D is suffering from declining success rates and stagnant pipelines. This provides the impetus and an opportunity to change the landscape of drug discovery by utilising Big Data information. The current ability to generate and store vast amounts of information has led to an abundance of data and a growth in the discipline of Systems Pharmacology. Data are generated from several stages in the drug discovery process, including pre-clinical animal tests and Phase I, II and III trials, as well as post-marketing monitoring.8 Effectively utilising these data will help pharmaceutical companies to better identify new potential drug candidates and to develop safe, effective, approved medicines more quickly. In this article, a new approach to optimising the use of animal models in drug discovery through Big Data is explored. Economic pressures, perhaps more than any other factor, are driving the demand for Big Data analysis and applications in drug discovery; this is appropriate, as it costs more than one billion US dollars to test and develop one new drug, and it often takes far more than ten years. In the early pre-clinical stage, the increasing costs of high-throughput screening of compound candidates, and of safety and efficacy studies in animal models, are major financial challenges to all pharmaceutical companies. Animal model data are an important part of drug discovery Big Data — however, primary data generated from drug discovery animal research are infrequently accessed or re-used remotely from where they were generated. There is limited access to detailed drug discovery animal model data, since full information about the protocols has not always been published in research papers. This has led to a drive by many journals to enhance the depth of details given in the Methods sections of manuscripts. Without this attention to detail, there have been missed opportunities for the continuous optimisation and improvement of scientific methods and enhancement of innovation. On the other hand, with the strengthening social pressures to avoid the use of laboratory animals in drug discovery, pharmaceutical companies and academia are finding it hard to demonstrate the application of the Three Rs principles to the satisfaction of the public. The sharing of full details of the animal models used in drug discovery would enhance the consistency of models between establishments and reduce the numbers of animals used to set up and validate the models. Last, but not least, changing the mind set about confidentiality is a big challenge for all public and private organisations. Pharmaceutical R&D has always been a ‘secretive’ activity, conducted within the confines of the R&D department, with little external collaboration. Unless it is possible to identify an ideal future state with non-competitive aims, there is little value to investing in improving Big Data sharing capabilities. Today, public–private partnerships still represent a concept to be tested — therefore, if a new approach of sharing the full details of animal models used in drug discovery demonstrated its value and reduced attrition, then there would be an enlarged space for future developments in sharing information. The sharing and cross-analysis of pre-competitive drug discovery animal model information across public research organisations, pharmaceutical companies, Three Rs organisations, biotech companies and contract research organisations (CROs), through a one-stop sharepoint, would contribute to the simplification of the partners’ operating systems, would facilitate the delivery of more products of value through reduced attrition, and would enable all the partners to build trust by demonstrating their commitment to the Three Rs. This one-stop sharepoint would allow data circulation within and beyond the original partnership. By enhancing interdisciplinary scientific reviews, animal studies could be optimised. Raw data, including cross-therapeutic animal models and protocols, drugvehicle effects, and positive and negative study results, would permit the assessment of the positive predictive value of each animal model. In addition, new information and hypotheses generated from data cross-analysis could be available to all partners, which would maximise the value of the animal research data. This non-competitive animal model information, such as guidelines on contemporary best practice and innovative alternative approaches to animal research, could also contribute to public knowledge and enhance animal welfare. In the end, by exchanging this information, all the partners would bolster external collaborations within and beyond the original partnership (Figure 1). all stakeholders can extend their knowledge and data networks through partnership. Ideally, the following objectives could be achieved: identifying and discontinuing the use of animal models that are not sufficiently robust or fail to translate in the clinic; optimisation of the design and validation of animal models and protocols (e.g. to improve translation of animal models between laboratories or decrease model severity, to facilitate the informed choice of animal models, to share best practices and Three Rs advances, and to reduce duplication of efforts). Academic partners could share insights from the latest scientific breakthroughs in cross-therapeutic animal models and make a wealth of innovation available. Normally, academia is willing to help improve the transfer of animal models between laboratories and the intra-laboratory reproducibility. Collaborations between the pharmaceutical companies could quickly identify and discontinue the use of animal models that identify treatments that fail to translate into efficacious medicines in the clinic. This could then lead to optimising the design/validation of animal models and protocols as a next step. This partnership could reduce clinical attrition, which would, in turn, reduce the financial cost of whole drug discovery process. Through collaboration with Three Rs organisations in order to learn best practices and Three Rs advances, stakeholders would enhance animal welfare by direct innovation and implementation of non-animal alternatives where they are the most needed, or by refining animal models to decrease severity and variability. Maximising external collaborations with CROs and new biotech companies could quickly add to or scale up internal capabilities and provide access to expertise in advanced technologies and animal models which would otherwise require establishment in-house. Although this pattern of collaboration appears to be a win–win situation for all the partners, belief in the benefits of the data sharing culture and active participation still needs to be inspired. All stakeholders would have to recognise the value of Big Data analysis and sharing and be willing to act on its insights; a fundamental mind-set shift for many and one that may prove difficult to achieve. Confidentiality issues would also continue to be a major concern, although new IT technology can readily enhance private information protection in the databases. However, stakeholders would still have to be vigilant and watch for potential problems, as the increasing amount of information on animal models that is becoming openly available has the potential to the misunderstood by the general public. Big Data sharing is a new approach to optimising the use of animal models in drug discovery. Sharing animal model information, such as protocols, study results (including drug-vehicle effects and positive and negative data) and translational outcomes, in a single cross-therapeutic platform that uses a standard data capture and common ontology framework, would permit the secondary analysis of multiple datasets. 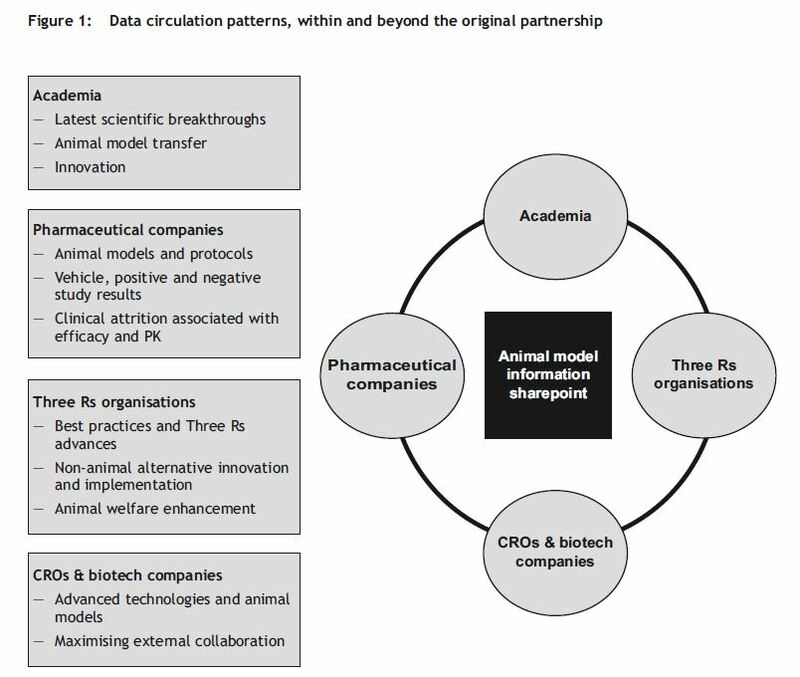 collaborations in animal research are identified as a high-impact opportunity for accelerating scientific innovation and improving scientific output in animal model research for drug discovery, and for more tangible contributions to the Three Rs ethical principles across all the pharmaceutical industry. Subsequently, animal test dataset sharing across multiple pharmas and some prominent CROs, would further permit the appropriate assessment of the value of animal use in drug discovery and would lead to a reduction in the numbers of animals used in this work. Finally, if the pool of animal datasets generated by pharmas/CROs were ultimately augmented by the experimental data from many prominent academic institutions, it would be possible to generate an animal test search engine similar to Google Scholar. In an ideal situation, any proposal to carry out an animal test or use a particular animal model, should start with a search to identify suitable assays and an assessment of the potential utility of the model. This could be done by viewing existing positive and negative animal test data, as well as easily contacting partners experienced in these assays for advice. In addition, further animal model optimisation could be performed or unnecessary animal tests could be prevented. This would ultimately reduce animal use and reduce drug discovery costs and would speed up the drug discovery process by affording a greater chance of successful translation of efficacy to the clinic. This work was supported by Key Projects in the National Science & Technology Pillar Program (No. 2011BAI15B03). The authors wish to thank Dr David Tattersall and Cheng Gao for their valuable suggestions. 1 Fabricio, F.C. (2014). Big data in biomedicine. Drug Discovery Today 19, 433–440. 2 Marx, V. (2013). The big challenges of big data. Nature, London 498, 225–260. 3 Groves, P., Kayyali, B., Knott, D. & Kuiken, V.S. (2013). The ‘big data’ revolution in healthcare: Accelerating value and innovation, 19pp. Center for US Health System Reform, Business Technology Office, McKinsey & Company. 4 SOTP (2012). Obama Administration Unveils “Big Data” Initiative: Announces $200 Million in New R&D Investments, 4pp. Washington, DC, USA: Office of Science & Technology Policy, Executive Office of the President, White House. Available at: https://www. whitehouse.gov/sites/default/files/microsites/ostp/big _ data_press_release_final_2.pdf (Accessed 19.09.15). 6 Harris, D. (2015). Google, Stanford say big data is key to deep learning for drug discovery. Houston, TX, USA: Knowingly, Corp. Available at: https://gigaom.com/ 2015/03/02/google-stanford-say-big-data-is-key-todeep-learning-for-drug-discovery/ (Accessed 19.09. 7 Anon. (2015). Apple HealthKit. Cupertino, CA, USA: Apple Inc. Available at: https://developer.apple.com/ healthkit/ (Accessed 19.09.15). 8 Zhang, J., Hsieh, J.H. & Zhu, H. (2014). Profiling animal toxicants by automatically mining public bioassay data: A Big Data approach for computational toxicology.